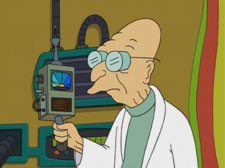 The Cool-O-Meter is an invention by Professor Farnsworth to detect how cool someone is. If someone is completely cool a thumbs up comes out and says 'oh yeah'. Zoidberg is not cool in any way, most people are half cool and Dwight, Cubert and Tinny Tim are completely cool when they imitate Bender. Coolness is measured in "Mega Fonzies." Mega Fonzies are a reference to the coolest character on Happy Days (Fonzie). Cool-O-meter is a pun on Coulombmeter. Farnsworth: Balderdash! I'll be the judge of who's cool, using the cool-o-meter! Farnsworth: Good Lord! I'm getting a reading of over 40 mega-Fonzies. This page was last edited on 9 May 2013, at 19:22.